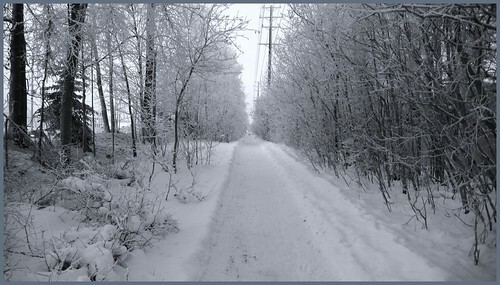 Contrary to what many would expect, Anchorage is really the ideal place to bike in Winter. The climate is favorable — not too cold to be comfortable [as you’d find in Fairbanks] most of the time; not so warm that it starts to get messy out there — and most of the time not prone to extreme winds or other hazards. Extreme precipitation tends to come and go in spurts. Many days I’ve watched blizzards out the office windows in the afternoon, only for the skies to clear by 4:30 for the ride home. Going to concentrate on commuting to work, on a bike with two inch wide tires [maybe a mountain bike, or a simpler non-suspension bike]. My favorite bike for commuting has no suspension, 29 inch wheels and gears in the back only with a single cog at the crankcase. The 29 inch wheels means it’s more effort to get it up to cruising speed [up on step, as the power boaters say] but once you are there it just flies along! This is my own set of ideas, mostly self-taught and each person’s approach is different. If you’re doing recreational riding instead, somewhat different considerations apply. You will want better clothing since you’ll be out there for longer periods of time. You’ll want a way to carry water and snack food and extra socks and so forth. I like bags that fit on the bike in some way, rather than wearing a backpack. The pack tends to feel binding and burdensome. The disadvantage of bike-mounted bags is depending on specific configuration/location they can impede clearance, and they tend to get dirty over time so it’s just one more thing to clean and maintain. 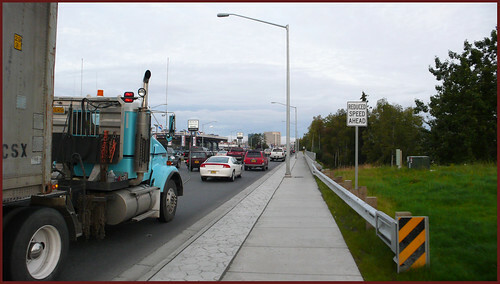 Since Anchorage is so compact, most work commutes are five miles or less, or 10 to 15 at most [though longer are possible, if you’re coming in from the far reaches of Hillside, or Eagle River]. I think the only way to ride recreationally here these days is on a fat tired bike, and I would give preference to the locally designed two options, the 907 and Fatback. But not everybody has that kind of money to spend on a bike, or can justify it for the amount of recreational winter biking they plan on doing. If you weigh less than 165 pounds you can usually do just fine out in the woods on two inch studded tires if you stay on the hard packed center line of the trail. I am about 210 now, should weigh 180 and will probably never be 165 again, so the fat tired option is best. The fat tired bike plows through sketchy conditions and less densely packed trails that would bog down two inch tires. Suspension isn’t needed because it’s provided by the low pressure balloon tires. Back to commuting. Let’s break this down into a few important topics, and then wrap it up. STUDDED TIRES. There’s a lot of choices and price levels. Studded tires used to be just for two inch wides, but lately they are available for skinnier tired road bikes and fat bikes too. I think it’s good to spend extra money on tires and economize on other aspects. Get the best ones you can. The ones made by Nokian are good — made in Finland [Helsinki is the same latitude as Anchorage, with similar winter weather]. Something about the rubber they use being more pliable in colder temperatures and thus less prone to cracking of the tread and loss of studs. On some bikes only certain tires will fit due to clearances to the suspension parts and frame. On my mountain bike, the top of the line tire fit on the front but I had to get a lesser one on the rear since the better one wouldn’t fit. If you have non-matching tires you always want the better one on the front. I would buy the tires from The Bicycle Shop, even if they are a little more expensive than REI or someplace else, for the expert advice and installation. The more expensive ones have a greater number of studs, and the stud pattern covers a greater width of the tire, the outer ones angled out to give you extra grip on slopes and when cornering. Don’t put the studs on too soon, Wait until the snow on the ground is definitely sticking, since the studs are annoying on dry pavement. You will learn to ride on the part of the road/sidewalk without exposed asphalt/concrete when available. CLOTHING. Most people have one outfit they wear for the ride, and do a complete change once they arrive at work. I do not like to do this, so I have a different approach where I just remove the outer layer when I get there. I don’t like to have to carry anything extra, or allot the extra time required to change. I like to leave home as late as possible to arrive on time [more or less]. I wear the same outfit for 35 degrees down to minus 15. On the bottom, a pair of long johns, knit boxers and jeans. Heavy wool socks and a good pair of leather shoes nice enough for the office [I don’t use biking shoes and toe clips; most people do and I probably should too but never warmed up to them so my bikes have regular pedals but they are the heavy duty metal ones with tines that keep a good grip on the shoe treads]. And 1″ wide yellow reflective velcro bands to keep pants from getting caught in the chain. On top, a light short sleeved shirt, the type that wicks sweat; then a fleece pullover that zips down so it is almost like a turtleneck when zipped all the way up. Topped off with a coat that has a hard shell and a fleece liner. Coat should be loose fitting enough that it doesn’t impede free movement; have enough pockets to stash stuff including your headlamp battery [the main pockets being large enough, and extra pockets [on the sleeve and inside] are a good bonus]. Pay special attention to fit on the sleeves, should be appropriate for arm length when you stretch arms out all the way, and the sleeves should be a snug fit to wrists but probably not with an elastic band. Consider the materials the pockets are made out of, too. Sometimes the pockets are a mesh material that isn’t very durable [keys and other sharp objects poke holes in it easily]. Rather than something you’d buy to run in, insulating qualities and durability will trump light weight. When it’s less than 25 or so I add a scarf that I can wrap around my neck and tuck in between the coat and fleece — a solid warm one, not something knit. 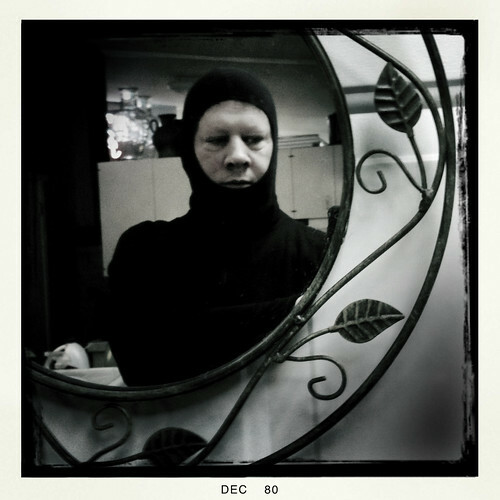 On the head, a balaclava [even a light, simple one works wonders] that covers the whole head and neck except for a small square of the cheeks, nose and mouth and eyes. If it’s warmer than 25, can wear the balaclava like a hat, folding the lower part up under the helmet. I have glasses these days, so they help cut the wind and protect from wind driven grit. Some people go a lot further [an enhanced balaclava with a filtered, louvered breathing cover over the nose and mouth; goggles or even large goggles that fit over glasses; snowboard helmets — but since my commute is 4.4 miles I find that other stuff unnecessary, and if it’s a colder day and my face starts to freeze I can just slow down a little bit and/or modify my route so I’m out of the wind more. For gloves, I use glove liners and then heavy mittens [with a ‘shell’ outer surface] over the top. The glove liners are useful because if you have to take off the outer mittens you still have something other than bare hands. The mittens are long and fit over the coat sleeve ends to close off any air gap. I always wear a helmet — just too risky not to. Whether the clothing is adequate for cold protection or not can be tough to judge. When starting off on a day that less than 10 above, it can seem really daunting for the first mile or so — you start seriously questioning your judgment and sanity, to be out in this F-ing cold!! Then you get warmed up and it’s pretty much no problem after that. Part of it is establishing a pace where you are at an elevated level of exertion, but something you can maintain for the whole distance — but a lot of it is just willfully suspending your disbelief at the beginning. If you ride much the same route each day you will start to realize the place where you should be warmed up. After you arrive, whether you change clothes or not, you will have an adjustment period being in a heated building again after being outside for a half hour or more. Since I don’t change clothes, I’m often sweaty and uncomfortably hot at first, but typically this passes quickly and I’m back to normal in 10 mins. or so. I don’t like riding in rain so much. I would not tend to start out from home in the morning under any more than trace amounts of rain. But I don’t get hung up on weather forecasts too much, because they are often wrong in their predictions — and because, if I get really wet on the way to work it is a problem, but on the way home it doesn’t matter, because I just strip when I get there and get into dry clothes. If I lived someplace where it rains a lot, I would figure out how to deal with it better. I do have rain pants [also used for hiking] that I can wear over jeans when needed, but I’d rather not. LIGHTS. Another area where if you can spend a little more you get a lot better safety and utility. I really wanted the $500 model but settled on one that cost $270 but was still considerably brighter [and better battery life] than the $100 model. Compare lumens, battery life on a single charge and price. [It’s a lot of money to spend, but if you start biking to work frequently rather than driving, doesn’t take long to make up for the cost by not buying so much gas.] The batteries recharge but eventually need to be replaced [but that likely won’t be for a few years]. One helmet-mounted headlight and one blinky taillight mounted to the seat post is what I use, and seems like the best solution. The helmet light can be easily adjusted on the fly, and you’ll want to keep the beam centered on a point about 20 feet ahead or a little less when your head is oriented in a normal upright position. Remember you can turn the light off and on along the way, depending on need or desire to be seen in order to conserve battery life. RIDING IN TRAFFIC. This aspect is the one people find the most frightening, and rightly so. Your commute will inevitably involve some amount of riding in the streets. Certain roads accommodate it better than others. Intersections are the biggest problem. I like to try to make my intentions clear and make eye contact with the drivers who could possibly hit me. You will encounter some real assholes, who tell you to get the hell out of the road or something meaner, but you just have to remember you have a legal right to be there [unless it’s a limited access road like parts of A and C Streets or the New Seward Hwy. that are specifically posted that bicycles are prohibited] and let the criticism roll off your back. You’ll get increasingly confident over time, but the key is to remain defensive and humble. WINTER RIDING STYLE AND TECHNIQUE. Best advice is to take things really slow in the beginning and speed up as you gain confidence. The studs will grip like anything, and you can ride over sheer ice, even a sloped surface of it without risk of the bike slipping out from under you. You should, however try to keep the bike more upright during turns and cornering, compared to leaning into it like you do in Summer. Shift legs and arms to the side opposite the turn, in order to keep the bike oriented closer to vertical. STORING THE BIKE AT HOME AND WORK. At our office we have hooks sort of like these [but even simpler and cheaper] to hang bikes on the wall. With the front end up, then the handlebar grips can hold helmets and outerwear clothing. Some wall protection is a good idea, and we have plastic oil pans underneath them so the runoff from the bikes won’t ruin the flooring. At home my commute bike sits in a corner of the living room by the front door on a 20×72 runner rug with a rubberized surface and that keeps the water and mud off the floor fairly well. You do not want to leave the bike outside at either place, mostly because it could get stolen — but also because the cold weather can make the brake and shifter cables gum up in their housings and other aspects of the bike won’t work well after prolonged exposure. CLEANING AND MAINTENANCE. If I am riding every day I usually completely clean up the bike on a weekly basis, and oil the chain twice a week. I flip it upside down and wipe down all the surfaces with glass cleaner and paper towels. [Then flip it up and clean from the top. Most of the dirt will be on the underside.] You can clean most of the wheel surface and the tire sidewalls by holding the moistened paper towel next to the wheel and spinning the wheel while the bike is upside down. Then go around and get the wheels between the spokes… and the spokes and the hub, the deraileurs, everything else. There’s special solvents for cleaning chains and cogs if you want to go that far. I don’t bother and instead just replace the chain and cogs every three years or so if the bike is frequently used in Winter. Use a good chain oil like T-9, sparingly. Visually inspect your tires frequently — often you can discover a piece of embedded glass and remove it before it punches a hole in your tube. Get a compressor at home so you can easily inflate your tires properly. WAYFINDING. This is an incredibly important subject. You will find most commutes involve some combination of the following: sidewalks [even though they’re supposed to be only for pedestrians]; side roads in the roadway; alongside main arterial roads at the edge of the outside lane or just outside of the lane; through parking lots; on dedicated bike paths and/or lanes. No one single way will get you wall the way from point A to B.
You’ll find there are many more ways than you thought, and advantages and disadvantages to each variation. My commute is from Mt. View to Midtown. In Summer I might ride the Chester Creek bike trail most of the way, getting on via a spur that takes off north from near Fireweed and A St., and taking the trail as far as Tikishla Park at Sunrise Dr. and 20th, then north on Sunrise and Airport Heights and into Mt. View. But in the Winter I mostly stay off the trail because it’s slow going and sometimes it seems like it’s ten degrees colder in that valley than the higher ground on either side. So I try to head into the valley at some convenient spot and climb right back out again. There are lots of sub-variations on the route, depending on how the Muni is choosing to plow or not plow sidewalks and trails along the way. For example, when the sidewalk is plowed the Glenn Hwy between Concrete and Karluk Streets is a good way to go — but at other times that sidewalk is used to stack snow plowed from the roadway and that route becomes tough to impossible — but the sidewalk and trail sections along Commercial and 3rd, two blocks north may have been well cleared all the way from Mt View into downtown. The way is usually a little different than the fastest route by car. Let’s say you are trying to drive from E. 5th Ave. to Midtown — the best way would be via Gambell or C St. By bike, the best way is either Karluk [that’s a wide but light traffic route all the way to 20th — switching over to Juneau St. from 17th to 20th — then you can dog-leg over to the sidewalk along Ingra/New Seward and ride up the hill to Northern Lights]; or Cordova St. that has a dedicated bike lane along most of its run from 2nd to 16th, with a thrilling hill at 15th and from 16th you can take a parking lot behind the stadiums and then ride 50 feet of the Chester Creek Trail and up onto the spur that takes you right back up to Fireweed and A St. Riding Midtown is mostly an exercise in skirting the periphery of parking lots of big box stores and malls, and trying to minimize intersection dramas. When I approach from New Seward and Northern Lights I take the Sears Mall parking lot around the north side of the mall, cross Benson on the west side of Denali St. and then right into the Wal-Mart parking lot and over to A and 32nd. Then it’s just a short jaunt, one more easy parking lot and two more instersections to the office. A good way to discover the routes and variations available is to go out on a few weekend days, when you don’t have to be there and scout it. Studying a map beforehand and/or along the way might help, but it won’t show all the ways that exist. 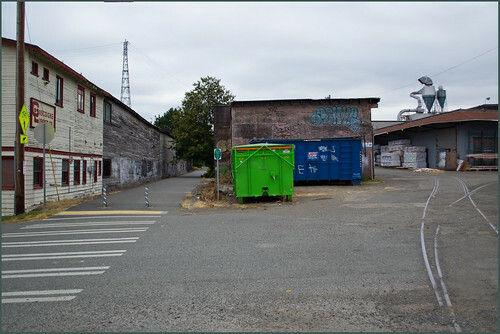 You might find you can cut through a park, or there’s a connection between two streets you didn’t know existed. 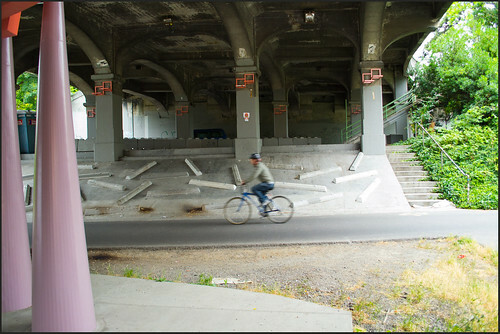 If the street you’re riding on seems too busy, look for another way nearby. KEEPING IT FUN. Change the route a lot. Smile at people out there doing the same thing you are. Consider car traffic in a whole new light. Appreciate all the sights, sounds and smells and small changes in the weather and atmosphere. Revel in sunny days and favorable riding conditions. Relax when you get home and enjoy the post-workout glow. Don’t try to do too much [errands at lunchtime, stopping to shop on the way home, going out after work]. All the way to work and back three or four days a week will be enough [though I sometimes like, especially in Spring and Summer to sometimes ride around a bit at lunchtime, or take a longer than necessary way home]. 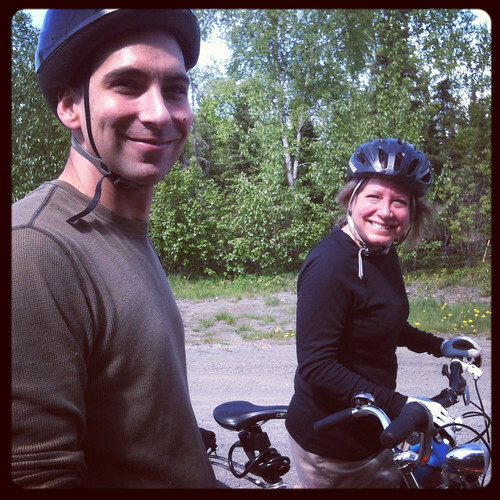 Biking to Eagle River with Claire and Michael. 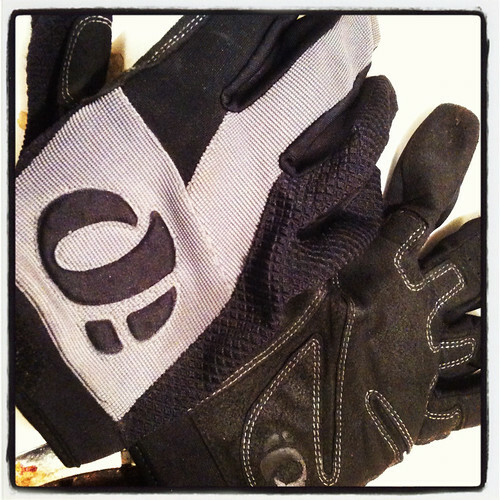 Really good fitting, functional biking gloves with enhanced middle finger! 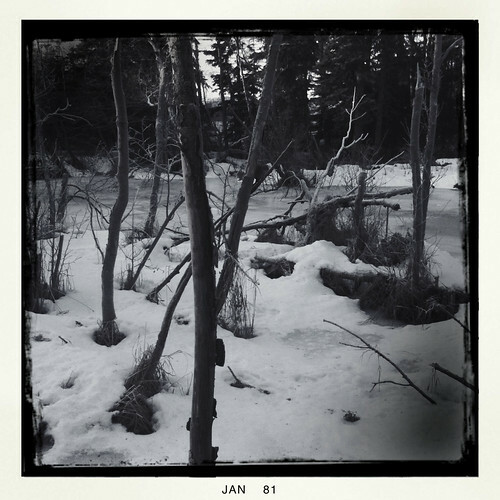 Mid-afternoon bike ride along Campbell Creek. 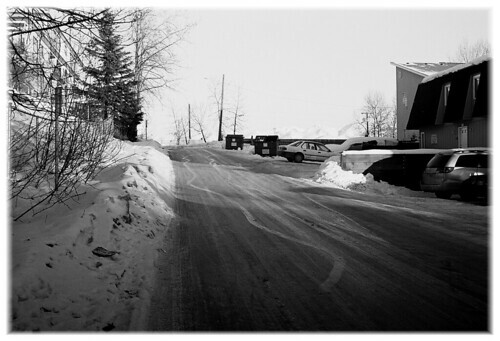 Early adventure in winter bike commuting -- E. 15th Terrace, Anchorage. Morning bike commute, Glenn Hwy. I saw about five times as many bike riders in the morning as on a typical day, and the city and a league of sponsors set up refreshment stations [including a ‘bacon station’ — ha!] on various bike routes. 1,880 riders on 155 teams registered for the event. 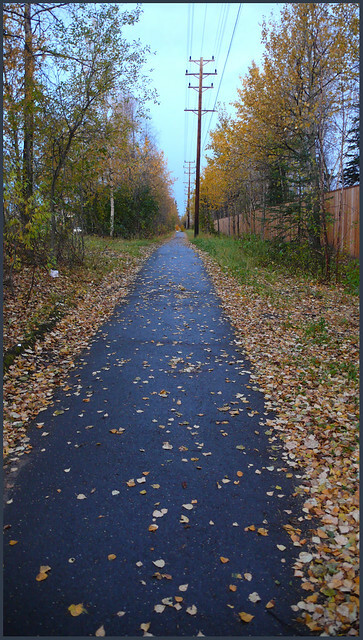 Anchorage is a fantastic place to get around by bike — as many have realized for a long time, with more and more joining in all the time.